On Wednesday, Secretary of State John Kerry was in Israel’s sovereign capital of Jerusalem (which the Obama administration does not recognize as such), lecturing the people of Israel and its government that he and the Obama administration deem new Israeli homes in the disputed West Bank area to be “illegitimate” settlements. Meanwhile, in the same neighborhood at the Palestinian Al-Quds University in Jerusalem, students were seen proudly displaying Nazi-like salutes, calling for the genocide of Israel’s Jewish population, and honoring terrorists as martyrs for their cause. Al-Quds is a Palestinian university in east Jerusalem. It is often hailed as a “liberal” or “moderate” university by western diplomats and journalists. It was established with the help of Israel in 1984, along with other universities Israel helped set up for Palestinians in Gaza and the West Bank with the aim of increasing the educational level of Palestinians. Academics and students (including, quite possibly, some in these photos) have received and continue to receive grants from European governments, charities and foundations. Al-Quds University is also currently in partnership with liberal (and largely Jewish) institutions in the U.S., including Brandeis University and Bard College. The student group was representing the greater Islamic Jihad organization in the Palestinian territories that has been labeled a terrorist organization by the United States and EU. While it is predominantly a Sunni organization, Islamic Jihad maintains strong ties along with financial backing from Israel’s primary geopolitical enemy and known state sponsor of terrorist activities throughout the globe: Iran. Following the latest round of negotiations, the Obama administration would confirm an additional $75 million in American taxpayer dollars towards foreign aid, disbursed into the Palestinian territories for various projects. 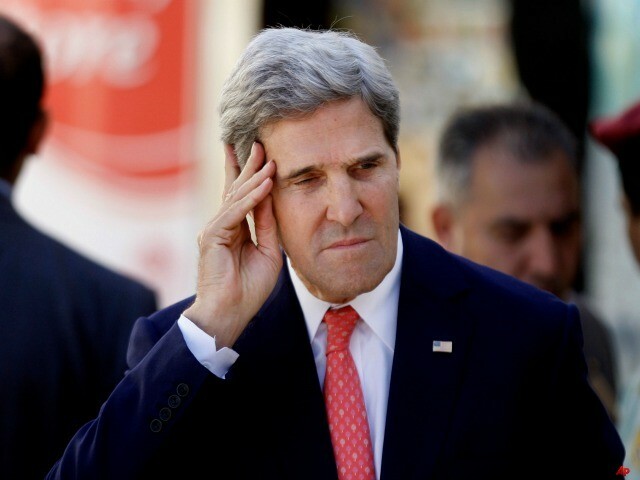 Secretary Kerry’s denouncement of Israel’s settlement building activities received international attention, praised by the New York Times as Kerry’s first step towards playing a more “muscular” role towards Israel’s “right-wing” and “volatile element.” By contrast, the Al-Quds University demonstration of openly fascist, genocidal overtures remained largely unreported outside of the Pro-Israel blogosphere.